If you're reading this, we're guessing that you're on the lookout for various tips for interviews in Singapore! Lucky for you, Singapore manpower agency, BGC Group has created a short article to help guide you through this nerve-wracking day. In an ideal world, everyone will be a smooth talker who can come up with witty replies on the spot. Unfortunately, some of us find it difficult to function during tense situations, like a job interview. Lucky for you, we recommend prepping everything before the interview! This includes coming into the interview prepared with a copy of your identity card, resume, and portfolio. We also recommend preparing the answers to some of the common interview questions asked during a job interview. Be prepared and do your research! Interviews are often sectioned off into different stages. 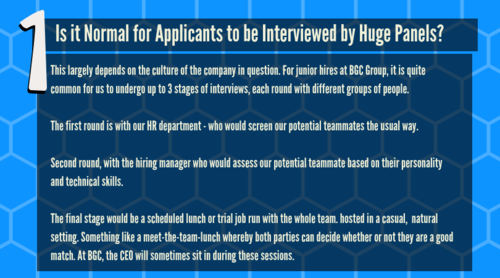 For instance, those interested in working at BGC will have to attend a three-stage interview - each round with a different group of people. Interviews offer differ from company to company, however, candidates who apply through BGC Group will first see a staffing specialist before being sent to our client for a second round! Tip 2: What Kind of Questions Should You Ask A.K.A. To Ask Or Not To Ask (About the Salary)? That is the burning question! Let's caution on the side of no. It's not a great move and you'll probably leave the interview session with a bad rapport. 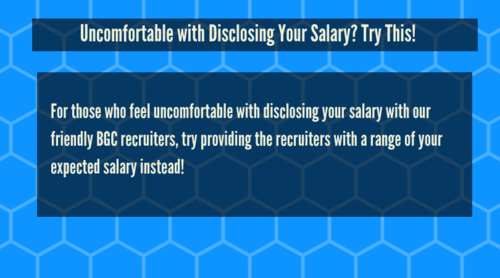 With this in mind, however, candidates often times avoid the question of salary expectations for fear of being "low-balled" or being placed at a disadvantage. At BGC Group, we use a candidate's past salary as a benchmark for us to place them in a job that matches their expectations to avoid disappointment. For the best experience, being candid about your salary expectations with your BGC staffing specialists would help speed up the process of finding you the ideal job. Here's a tip! Research everything! We've mentioned this before in our previous article, "What Our Interns Actually Think of Company Culture" written by our intern, Ben. But like all mothers who care, we're going to remind you to research, research, research! Or read below for Ben's story about how he had to step greatly out of his comfort zone as a 100% introvert during his first internship. All due to his lack of research both before and after the interview session. "During the interview, I was impressed by their professional front. I had my fingers crossed that I will be getting the job. I was also impressed by all the marketing terminologies the interviewer used as I thought I could gain real-life exposure to marketing. Unfortunately, things started to turn a little sour during the second interview. I was first brought around the office to be introduced to my new colleagues. Of course, this went smoothly, but afterward, I was told to go on a field trip - which to put it succinctly, involved doing a lot of door to door sales. 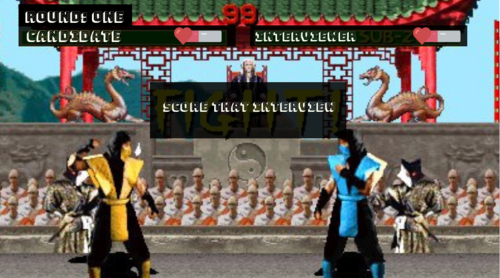 As you can imagine, this was a nightmare for an introvert like me. Despite this, I was thankful that they provided me with an insight into the job. 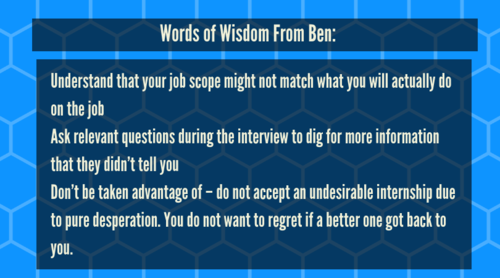 It helped me understand that the job scope wouldn't match my personality, and made it easier for me to turn down," said Ben. Worried that your next internship or job stint could turn into your worst nightmare? Not sure if you should take up the job or not? We'd like to put it this way - you'll never know what you will or will not like if you don't try it! "At the end of the day, it's all about taking risks in life to find true passion". Who knows, you may find a passion in something you think you'll hate!" - Yijie, our intern. Tip 4: Get yourself prepared! It's no secret that job interviews are nerve-wracking. As someone who has been to multiple job interviews in one day, I can tell you that the nerves do not settle until I heard back from the recruiters. And whilst you cannot control your nerves or how unsettled you are, you can spend the day reminding yourself to take it easy. Listen to a calming Spotify playlist while waiting. We recommend this one! Just remember that those interviewing you can sense how nervous you are. Relax, memorise your answers, practice your elevator pitch, and you'll breeze your way through! Attending an interview session at the BGC office? We recommend reading our article, "Read This if You Want to be a Top BGC Recruiter" for a glimpse at the character of our BGC recruiters! Don't forget to treat yourself to something nice after the interview! You deserved it! Know of any other interview tips and tricks? Let us know in the comments section below! Additionally, don't forget to check out the links below for more fun and interesting reads.